The current crash in oil prices is sowing the seeds of a powerful rebound and a potential supply crunch by the end of the decade, but the prize may go to the US shale industry rather OPEC, the world’s energy watchdog has predicted. America’s shale oil producers and Canada’s oil sands will come roaring back from late 2017 onwards once the current brutal purge is over, a cycle it described as the “rise, fall and rise again” of the fracking industry. “Anybody who believes the US revolution has stalled should think again. We have been very surprised at how resilient it is,” said Neil Atkinson, head of oil markets at the International Energy Agency. 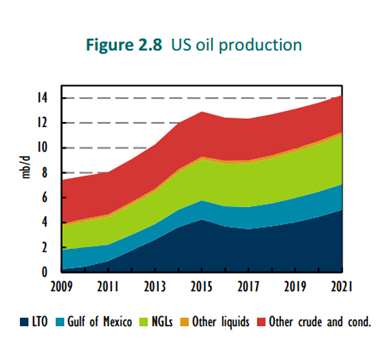 The IEA forecasts in its “medium-term” outlook for the next five years that US production will fall by 600,000 barrels per day (b/d) this year and 200,000 next year as the so-called “fracklog” of drilled wells is finally cleared and the global market works off a surplus of 1m b/d. But shale will come back to life within six months – far more quickly than conventional mega-projects and offshore wells – once crude rebounds to $60. Shale output is expected to reach new highs of 5m b/d by 2021. This will boost total US production of oil and liquids by 1.3m b/d to the once unthinkable level 14.4m b/d, widening the US lead over Saudi Arabia and Russia. Fatih Birol, the IEA’s executive director, said this alone will not be enough to avert the risk of a strategic oil crisis later in the decade, given the exhaustion of existing wells and the dangerously low levels of spare capacity in the world. “Even if there were zero growth in demand, we would have to produce 3m b/d just to stand still,” he said, speaking at the IHS CERAWeek summit of energy leaders in Texas. Mr. Birol said investment in oil exploration and production across the world has been cut to the bone, falling 24% last year and an estimated 17% this year. This is a drop from $520bn to $320bn a year, far below the minimum levels needed to keep up with future demand. “It’s not good news for oil security. Over the past 30 years we have never seen oil investment dropping two years in a row,” he said. The warnings were echoed by OPEC’s secretary-general, Abdalla El-Badri, who said the current slump will lead to serious trouble when the cycle turns. “It sows the seed for a very high price in the future,” he said at the CERAWeek forum. Mr. El-Badri said he had lived through six oil cycles over his career but the surge of shale oil supply from the US has made this one of the most vicious. “It is a supply bubble. This cycle is very nasty,” he said. The OPEC chief admitted that the cartel has been caught badly off guard by crash, blaming the wild moves on speculative forces with control over 5m “paper barrels” on the derivatives markets. “The fundamentals have not changed that much,” he said. But Mr. El-Badri sent mixed signals about the real problem in the crude markets, letting slip that OPEC and the US shale industry may not be able to “live together” and that frackers will take advantage of output cuts intended to stabilize the market. “If there is any increase in price, shale will come back immediately,” he said. Contrary to widespread assumptions, the IEA report said Saudi Arabia and the OPEC club will lose market share, treading water as North America and Brazil’s “pre-salt” basin in the Atlantic account for most of the growth in global output by the early 2020s. Algeria, Venezuela, Nigeria and Indonesia are all going into decline. Iran’s grand plan to reach 5m b/d and regain its place as the cartel’s number two is dismissed as “aspirational”. It will struggle to add much once it has recaptured its pre-sanctions level of 3.6m b/d. Iran’s major fields are 70 years old and need sophisticated technology, yet foreign investors are wary of taking the plunge. 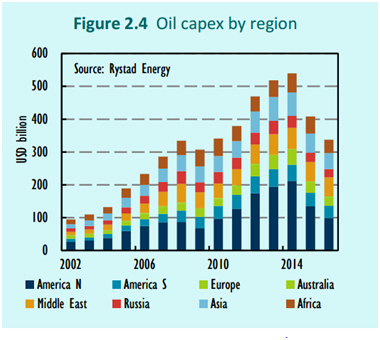 Outside OPEC, there will be a steady erosion of output in China, Mexico, Colombia, Egypt, Oman and the North Sea, all chipping away at global supply and leaving the world vulnerable as demand rises by an average of 1.2m b/d each year – hitting 100m b/d by 2020. China’s demand will ratchet upwards by an accumulated 2.5m b/d even as its own output slips, a scissor effect likely to tighten the global market relentlessly from 2017 onwards. The IEA report implicitly calls into question OPEC’s strategy of flooding the market in order to cripple of the US shale industry. Asked if the policy had failed, Mr. Birol deflected the question diplomatically. “I wouldn’t could call it failure of this group or that group, but there is a new fact of life: we can produce oil at $50-$60. It is the success of oil industry,” he said. While the OPEC strategy is finally forcing frackers to shut down, it has taken far longer than expected and may prove fleeting since private equity groups armed with a $60bn war chest are waiting to buy up the assets of failed shale companies. The strategy has been prohibitively costly for OPEC itself. Annual revenues have dropped from a peak of $1.2 trillion to around $400bn at today’s prices, and a large part of this is a result of OPEC’s own actions. The IEA said US frackers have been able to cut costs by 25%-30% and even more in the Permian Basin of West Texas. “A year ago it was widely believed that this would happen by the end of 2015 but that view has proved to be very wide of the mark. In 2014 and again in 2015 supply exceeded demand by massive margins,” it said. Much of the confusion is over the US “rig-count”, which has dropped from 1,500 to 440. “Oil production has not fallen nearly as quickly as the rig-count alone would suggest,” it said. Russia is perhaps the biggest casualty, given that it is trying to fund a superpower military status and cover half its budget comes from oil and gas revenues. Its output will fall by 275,000 b/d as the old Soviet fields in western Siberia go into decline. The Vankor, Uvat and Verkhnechonsk fields all boosted growth last year but there is little else new on the horizon. “Russia is expected to see the steepest output declines,” said Mr. Birol. Further, Mr. Birol said it is a “heroic task” to interest anybody in the Houston oil fraternity in climate change. US frackers view it as a ridiculous scam that will die with a Republican president next year. — US Shale Revolution Will Ruin Russia, Iran, and OPEC was originally published at To The Point News.